President Trump’s recent budget proposal breaks that promise. It would defund the Manufacturing Extension Partnership, or MEP, which has been proven to help manufacturers create jobs. 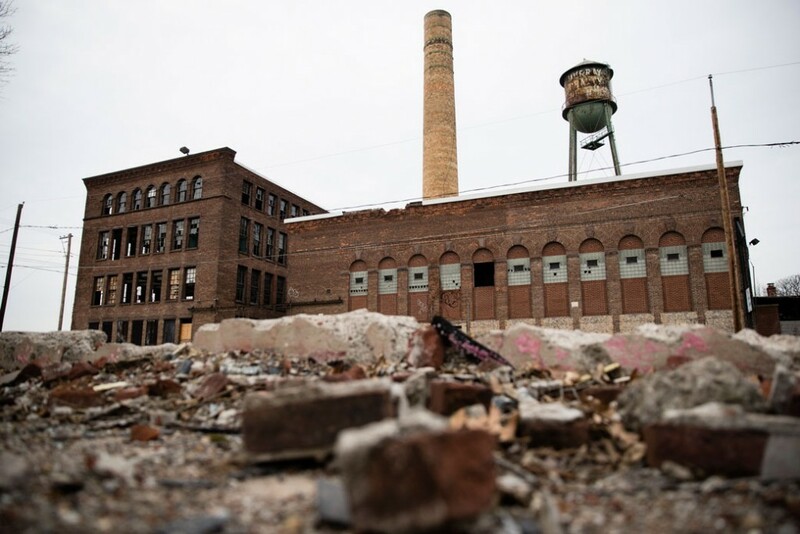 It would also defund the Economic Development Administration, or EDA, which helps communities affected by the disappearance of manufacturing jobs recover. And it would defund the programs that will enhance the future competitiveness of American manufacturing. Trump’s budget is yet another example of his betrayal of working families. 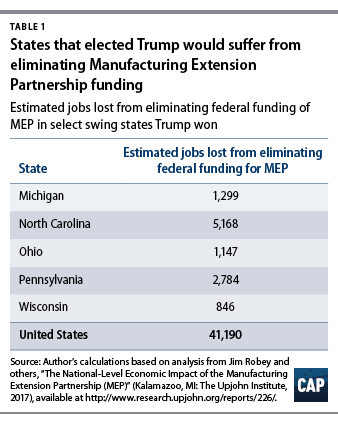 The Trump administration budget eliminates federal funding for MEP, a 30-year-old public-private partnership that helps small- and medium-sized manufacturers compete. The program consists of a national network of centers that provide services to manufacturers, such as improving production processes, enhancing their technological capacity, and facilitating their product innovation. These cuts are a direct violation of President Trump’s promises to bring back manufacturing jobs. A recent analysis of the program by the W.E. Upjohn Institute for Employment Research shows that MEP generated an additional 82,000 jobs in 2016 that wouldn’t have existed otherwise. That amounts to more than 100 times as many jobs as the 800 Trump claimed to have saved in negotiating a deal with Carrier in Indianapolis. Given that the federal government pays up to half the cost of the program, Trump’s proposal to eliminate federal funding could cost 41,000* jobs. 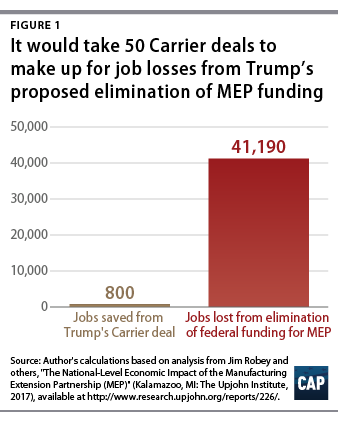 Trump would have to negotiate more than 50 additional Carrier deals to make up for the job losses from defunding MEP. The job losses from eliminating MEP would also be concentrated in the swing states that elected President Trump. More than one-quarter of the job losses—11,000—would occur in Michigan, North Carolina, Ohio, Pennsylvania, and Wisconsin alone. North Carolina—a state that has seen its manufacturing industry collapse during the last 15 years—would experience the largest job loss—more than 5,000—of any state in the country. These job losses are even more inexcusable in light of the low cost of MEP: just $130 million in 2017, or 0.003 percent of total federal spending. And the Upjohn analysis of the program shows that it more than pays for itself—each dollar spent on the program increases tax revenue by $9** as a result of the jobs, investment, and production it supports. Trade Adjustment Assistance for Firms, or TAAF: A program that provides technical assistance to companies that have been hurt by foreign competition. Investing in Manufacturing Communities Partnership, or IMCP: A program that supports manufacturing in distressed communities. Regional Innovation Strategies, or RIS, program: A program that promotes clusters of innovation and entrepreneurship. These cuts would once again heavily affect the swing states that elected President Trump. 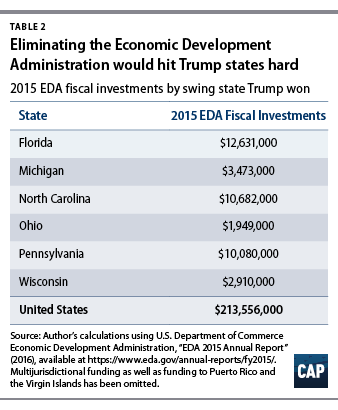 Of the $214 million in EDA funding that went to specific states in 2015, $42 million, or 20 percent, went to Florida, Michigan, North Carolina, Ohio, Pennsylvania, and Wisconsin. The biggest losers would be Florida, North Carolina, and Pennsylvania, which receive more than $10 million apiece. $1.4 million in disaster relief funds to assist in the renovation of the Florida Institute of Technology’s Center for Advanced Manufacturing and Innovative Design, or CAMID, in Palm Bay, Florida. Firms using space at CAMID will have access to workforce training, advanced software, and manufacturing equipment. $1 million to renovate and customize two buildings for workforce training in advanced transportation and industrial maintenance at Wilson Community College in Wilson, North Carolina. The project will provide training and retraining to local workers to address a local shortage of skilled workers in those fields. $500,000 to Pennsylvania State University’s TechCelerator, a preaccelerator designed for early tech-based startups, providing business and market research services to help entrepreneurs. The program is designed to develop a pipeline of startup activity in Centre County, Pennsylvania. The Trump budget would also undermine future manufacturing job creation by defunding research programs that are critical to manufacturing competitiveness. Clean energy and efficiency technologies are central to the future of American manufacturing, including, for example, employing approximately 38,000 people in solar power manufacturing and about 289,000 employees manufacturing energy efficient equipment, such as lighting, appliances, or HVAC equipment. The Trump budget proposal would defund U.S. Department of Energy projects vital to the future of American manufacturing, such as the Advanced Research Projects Agency-Energy, or ARPA-E; the Fossil Energy Office; the Office of Energy Efficiency and Renewable Energy, which includes the Advanced Manufacturing Office; and the loan programs, including the Advanced Technology Vehicle Manufacturing Program. The loan programs finance projects that re-equip, expand, or build new and innovative technologies across the efficiency, renewable energy, advanced fossil and nuclear energy suite, including manufacturing facilities that produce advanced technology vehicles. These investments enable manufacturers to demonstrate the commercial viability of new technologies or incorporate new technologies into their own supply chains, increasing confidence in private sector investors and boosting their adoption in the broader market. Defunding these programs is a decision not to compete in the manufacturing industries of the future. President Donald Trump’s budget is a betrayal of his promises to workers who elected him into office. It cuts funding for job training and enforcement of wage theft laws while gutting funding for safety net programs on which working families rely. But it is perhaps the height of hypocrisy for a candidate who campaigned on Rust Belt anger regarding the disappearance of manufacturing jobs to propose the elimination of funding for federal programs that help manufacturing workers, companies, and communities. *Correction, March 27, 2017: This column incorrectly stated the number of jobs that could be lost as a result the Trump budget cutting federal funding from MEP. The correct number is 41,000. **Correction, March 27, 2017: This column incorrectly stated the amount by which tax revenue increases with each dollar spent on MEP. The correct amount is $9. Brendan V. Duke is the Associate Director for Economic Policy at American Progress.